Mustard Greens are popular in Northern India particularly in Punjab, where is cooked with spinach in Sarson ka Saag. This mustard has an upright plant habit, it grows to 2 feet and has a dark green, heavily curled leaf. An excellent producer, Basanti is resistant to bolting, therefore it can be grown well into the summer. Mild and succulent in all dishes. 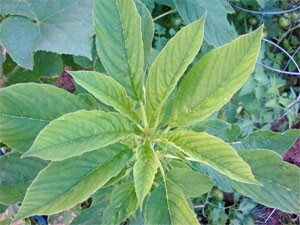 Bathua--also known as lamb's quarters or cheel bhaji, is an ancient plant, related to both beets, spinach, and quinoa. Does well in cooler climate so it is best grown in spring or fall. 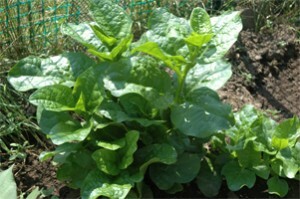 Once grown, the leaves can be harvested and used like spinach. Chukkakura looks similar to spinach, with broad dark green leaves and thick stems. 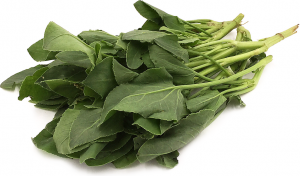 Chukka leaves are sour and a bit meatier than spinach and they are triangular in shape. The pungent leaves have a tart, lemony flavor. 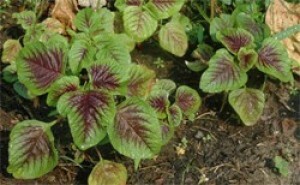 This variety of sorrel is known as Khatta palak, Ambat chukka, Indian Sorrel and Chukka Kura in various parts of India. Known as koshta in India, the edible leaves are also used extensively in the Middle East, Africa and the Mediterranean, to provide a much prized viscous texture to soups and stews, similar to okra. High in nutrition, eating 5 oz of this vegetable can provide the recommended daily allowance of iron, twenty times more than cabbage and four times as much as spinach. 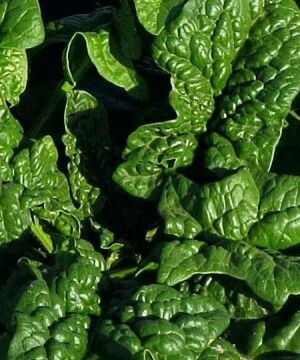 It also provides twice as much Vitamin A in each serving as spinach. In Egypt it is prepared with chicken and other meats. In Italy it is called Mazzocchi. Best grown in soil rich in compost, and earthworm manure. .
‘Palak‘ in Hindi and Punjabi, ‘Pachchali Koora‘ or ‘Palakura‘ in Telugu, ‘Vasala Cheera‘ in Malayalam, ‘Pasalai Keerai‘ in Tamil, and ‘Palang Sag‘ in Bengali. Very cold-hardy heirloom variety with dark green leaves and heavily savoyed texture. Exceptionally rich in carotenoids, including beta-carotene and lutein, and also contains quercetin, a phytochemical with antioxidant properties. 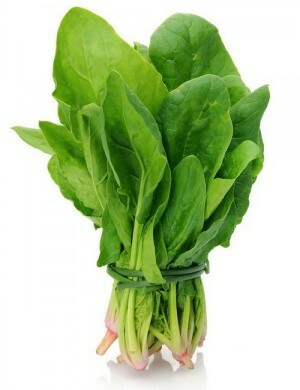 It is also rich in vitamins A, E, K, and C, calcium, iron,, and potassium. and minerals, particularly folate (folic acid), magnesium, and manganese and iron. (Basella alba)A red stemmed cultivar of malabar spinach, it can be grown just like it's green stemmed counterpart. The succulent leaves and stem tips are rich in vitamins A and C and are a good source of iron and calcium. They may be eaten raw in salads, boiled, steamed, stir-fried, or added to soups, stews, tofu dishes, and curries. Or you can use them as a filling for quiche, omelets, savory turnovers, and potpies. 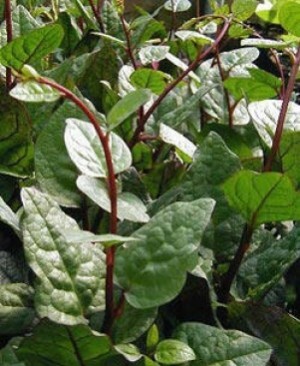 Since red-stemmed Malabar spinach can lose a lot of its red color when cooked, perhaps it is best utilized (visually speaking) in raw dishes. Known as pui or poi sag in Bengali. (Basella alba)This variety has green leaves and green stems. Malabar Spinach is not really a spinach at all, but the fleshy leaves tastes similar, and grows better in the heat of the summer than real spinach. A vine, it should be planted where it can climb. Seeds can be sown in March or April indoors, and they will germinate within 10 - 21 days. Pre-soaking the seed for 24 hours in warm water shortens the germination time. The plant can be put outside after the last expected frosts. Does best when amply watered. Known as pui or poi sag in Bengali. (Hibiscus sabdariffa) This tangy vegetable grows up to 1 foot tall and has edible lobed leaves. The stems are reddish. This vegetable is often prepared as a pickle or with chicken or mutton. Popular in the Indian states of Andhra Pradesh and Orissa (called Nalite saga in Oriya, Belchanda' among Nepalese, Tengamora among Assamese). In Thai it is know as KraJiabDaeng , som phor dee in Lao, Chaye-Torosh in Farsi, karkade in Arabic, Rosela in Indonesia, asam belanda in Malaysia. Another important edible part is the fleshy sepal (calyx), which is intense red and tastes acidic. Sometimes used as a cranberry substitute it is used to make jelly and juice. 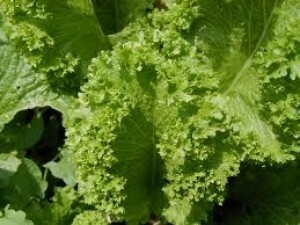 The leaves and young stems are eaten raw in salads or cooked as a vegetable. It is also known to be a mild laxative and mild diuretic. We recommend soaking seeds for 24 hours in warm water before sowing. Green stemmed or white stemmed variation of gongoora. (Hibiscus sabdariffa) This tangy vegetable grows up to 1 foot tall and has edible lobed leaves. The stems are light green This vegetable is often prepared as a pickle or with chicken or mutton. Popular in the Indian states of Andhra Pradesh (Tella Gongura) and Orissa (called Nalite saga in Oriya, Belchanda' among Nepalese, Tengamora among Assamese). In Thai it is know as KraJiabDaeng , som phor dee in Lao, Chaye-Torosh in Farsi, karkade in Arabic, Rosela in Indonesia, asam belanda in Malaysia. Another important edible part is the fleshy sepal (calyx), which is intense red and tastes acidic. Sometimes used as a cranberry substitute it is used to make jelly and juice. 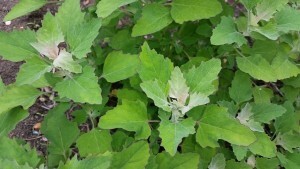 The leaves and young stems are eaten raw in salads or cooked as a vegetable. It is also known to be a mild laxative and mild diuretic. 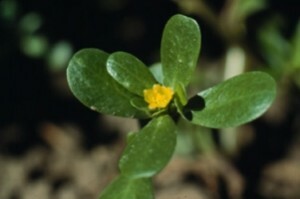 (Portulaca oleracea) Also known as purslane in the U.S. eaten as a green in Andhra Pradesh. It can be eaten fresh or cooked and has no bitter taste at all. Since it has a mucilaginous quality it is great for soups and stews. (Amaranthus spp.) 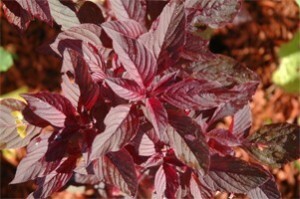 This variety is Reddish-Green leaved variety. 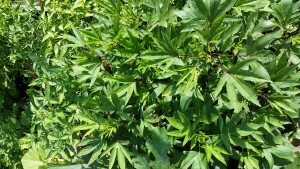 It is a vigorously growing vegetable in warm weather. Some people grow this variety as decorative plants as well as a leafy vegetable. Young leaves and stems can be harvested periodically for a long time during the growth. Sharp and somewhat narrow leaves. Maturity: 25-30 days. (Amaranthus spp.) This red variety is very popular. Broad dented leaves. It will release red color into soups and dishes when cooked. Maturity: 25-30 days. 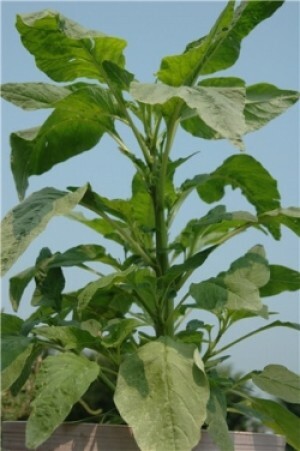 Green variety of Amaranthus popular in Andhra Pradesh. It is often cooked with dals. 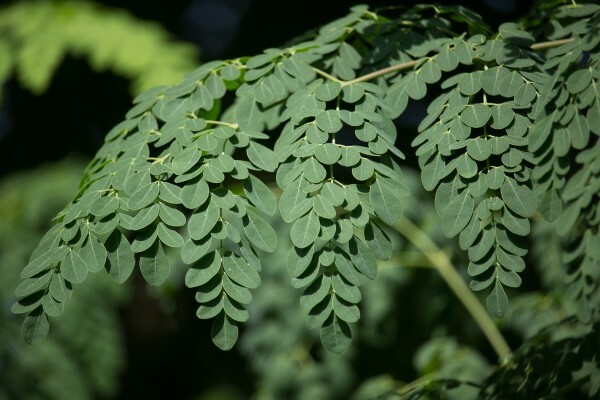 Totakoora (or totakura) provides excellent roughage in your diet and is rich in calcium, iron and vitamin A and C. Available in larger quantities. Large 10" heads form on sturdy plants, in 70 days from setting out in the garden. What is truly amazing about this variety of cauliflower is that they have self-wrapping leaves that protect the curds from sunburn and cold. No more tying leaves when the florets form. Tight florets form a nice round cauliflower bursting with flavor. For spring, start seeds indoors 5-7 weeks before moving them into the garden. For a fall crop, start seeds in late summer. Large drumhead type cabbage. 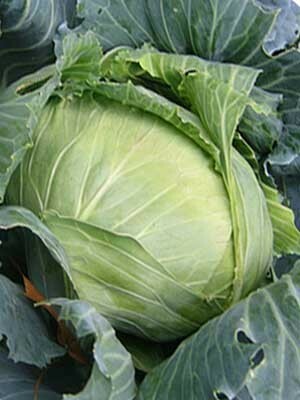 This cold hardy cabbage is perfect for fall/winter growing. This variety is also heat resistant, fine-flavored and produces good, hard heads that are ten inches in diameter, averaging about 12 pounds in weight, and are round but flattened on the top. One of the first yellows resistant varieties. 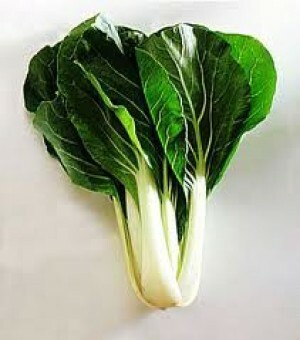 Bok choy or pak choy (brassica chinensis) is a super healthy green vegetable in the cabbage family. An easy and quick grower. 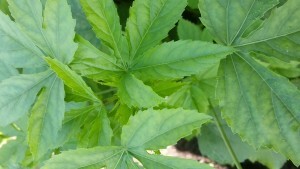 This variety has a thick and pure white petiole with smooth round dark green leaves. Good for stir frying and soup. High in Vitamin A, Vitamin C and calcium, and a rich source of many vital phyto-nutrients, anti-oxidants, and it is low in calories. One of the most popular mainland crop in China, Philippines, Vietnam and Korea.